(Logan, UT — May 31, 2018) Altra’s elite athlete Tyler McCandless dominated the Memorial Day racing scene by winning the BolderBOULDER 10K with a time of 30:54. McCandless had the race’s only sub-five mile splits between the third and sixth miles and he beat second place by only 26 seconds. Winning the 10K took four years of hard work for McCandless. He first ran BolderBOULDER in 2015 with a time of 32:35 for 26th place. In 2016, he ran a 32:05 for 6th place and in 2017, he ran a 31:04 for 4th place. His perseverance led to an impressive first place finish and his fastest time yet. 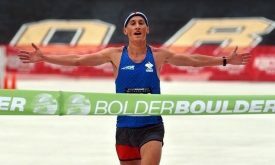 Since BolderBOULDER’s start in 1979—this year is its 40th anniversary—the race has become one of the largest, most highly acclaimed 10K’s and was named “America’s All-Time Best 10K” by Runner’s World. The race has over 50,000 participants and 100,000 spectators every Memorial Day. Check out the Team Altra Facebook page to stay updated on McCandless and all of the accomplishments made by Altra’s Elite and Red Teams.